I have decided that Karina Bliss is an author I do not read enough of. I need to read more of her books. I started this one during the RT Convention and stayed up waaaaay too late reading it. In that wonderful way that really good books have, it just pulled me in and I didn’t want to put it down! Lee, an SAS (Australian Special Forces) soldier who was thought to be killed in battle has been found alive. His return home is more challenging than he expected. Everyone has moved on with their lives, except his ex-girlfriend. 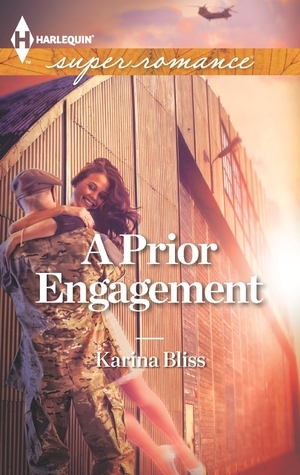 Even though she turned down his proposal on the eve of his deployment, she now appears to be one of his family. They think she was his fiancee. He wonders what is going on and why she would deceive his friends and loved ones. Jules knows that Lee will be furious with her for lying to his SAS buddies and family who have now become *her* friends and family. She figures they may hate her, too, once they hear what she did. And all of this is made even more complicated because Lee appears to have amnesia and claims he can’t remember what happened between them before he deployed. This isn’t a set up that would normally pull me in, but I’m SO glad I read this book. I don’t like big misunderstandings or lies between the main characters, but this really worked for me. Jules is pressured by medical and psychiatric experts to take it easy on Lee. She is determined to tell him the truth and explain her motives behind the lies, even though she doesn’t expect him to forgive her. She just wants him to find his footing in his life before her revelations do further damage. Concentrating on getting even with Jules gives Lee something to focus on in a world that seems so different to him. Interestingly, because he wants Jules to pay for lying to his friends and family, he’s willing to let her take care of him. He thinks he’s unworthy of her and he thinks if they really loved each other he’d hit the road rather than have her seem him struggle to recover from his captivity. But because he’s upset with her deception, he’s willing to impose on her in ways he wouldn’t if they were being honest. That is very interesting! I think the PTSD and recovery from Lee’s captivity is very realistically portrayed. We’re in Lee’s head a lot, so we see how mixed up he feels, but we also see his actions, which could be confusing to outsiders. Jules and the rest of Lee’s friends work very hard to anticipate Lee’s needs, and this drives Lee crazy when he realizes what’s going on. In the middle of this very real feeling personal conflict, Karina Bliss writes some believable humor and friendships. The guys especially are funny together. ‘What are you, my babysitter?’ Hemmed between his friends, he felt like he was being observed, watched. Notwithstanding their benevolent motives, Lee had to keep reminding himself they were on his side. His nerves only recognized that they were elite soldiers. The whole book is really well done. A little slow moving at times, but that doesn’t bother me. This is the fourth in this series of books. I read the first one and enjoyed it (despite it’s over the top ending) but I haven’t read the second or third. This fourth one stood alone pretty well. There is a large circle of friends, along with both names and nicknames that got confusing at times, but I kept up pretty easily. I do want to read the two books I missed now, though! If you’re looking for realistic drama with a dose of humor, Karina Bliss is the way to go!